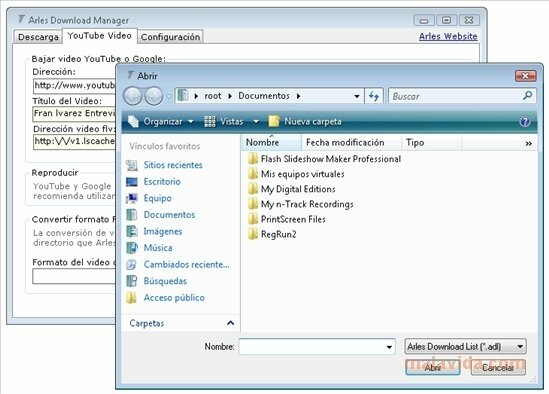 Arles Download Manager is a program with which not only will you be able to manage the download of files from any website, you will also be able to use it to manage the transfer of files from services like RapidShare or use it to be able to get videos from pages like YouTube in quickest possible way. To be able to use the program you will only have to copy the links of those that you want to download an paste them in the application. Once added to the queue you will need nothing more than to wait for each of the transfers to finish. The interface is very clear and it shouldn't involve any problem for any user, because all the accesses to the various functions are visible from the main window, something that makes it easier to use and turns it into a very intuitive development. If you were looking for a program with which to be able to download practically anything from Internet in an organized and intuitive way, you may need to get ahold of Arles Download Manager as soon as possible, as totally free application.